The "Take It!" 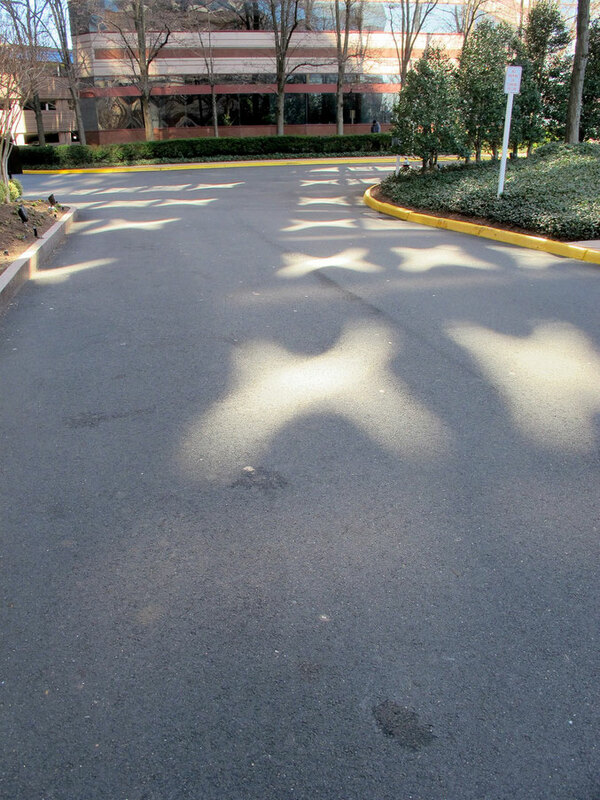 The images of these near perfect rows of welcoming glowing X marks the spots on the way to the garage for the building was overwhelming. I cannot help but think those lucky enough to be working in this wonderful address must feel a touch of giddyness in having such a greeting even before they enter the building. The sun has a time when it gives a perfect reflective bounce off of the well spaced windows to give this great effect. As you can see - there is a sort of passage way in the images, giving the driver the option to drive down a sort of lucky avenue within an avenue. The other option is to drive right into the images and let them flow over the car - one by one on the way to the garage which is at the upper right of the picture. I have done both approaches just to enjoy the separate sensations. The After Take: The fact of the matter is that I could well be one of the very few out of the hundreds that work there who ever notice this display of reflective splendor. I kid you not when I say that most who work there are driving the latest in BMW's, Mercedes, Porsches, and other extremely cool cars and may not even see it. When one is standing there as the parade of these cars and the types that drive them come in - it is almost as if it is the final stretch to get to the finish line in the great first laps of the day long race they are in called their lives. My hope is that they are enjoying every ounce of their fast pace. Another barrier to their witnessing this ever so cool welcome is that the garage has interior connection to the office building which is almost erie in that one never sees anyone walking outside these fully occupied buildings. It is as if the structures swallow up all these cool cars in the morning - then spit them all out ( in close race formation ) at night when it is time to go. I have not been there to see if there is some of the same sparkle to bid them farewell - but it doubt it. Some things are just meant for the morning. Every once in a while - put some slow on your go - you may just get lucky and see another show. All my best to all you racers. Thanks for joining us for the current photo presentation. You are cordially invited to return Friday April 20 for a new picture that we hope you will enjoy. That is a crazy reflection! This is a fun one.... So many different fun taglines can be made from this. This one cracks me up big time. Can you imagine one of those actually having something worthwhile under it. It'd be such a pain to have to dig up even one of those, let alone 25!